The Ivanti Administrator console lets you perform network management functions from one location. From a single console, you can distribute and update software or configuration settings, diagnose hardware and software issues, deploy OS images and migrate user profiles, use role-based administration to control user access to both features and devices, use remote control features to train end users or resolve problems, and more. 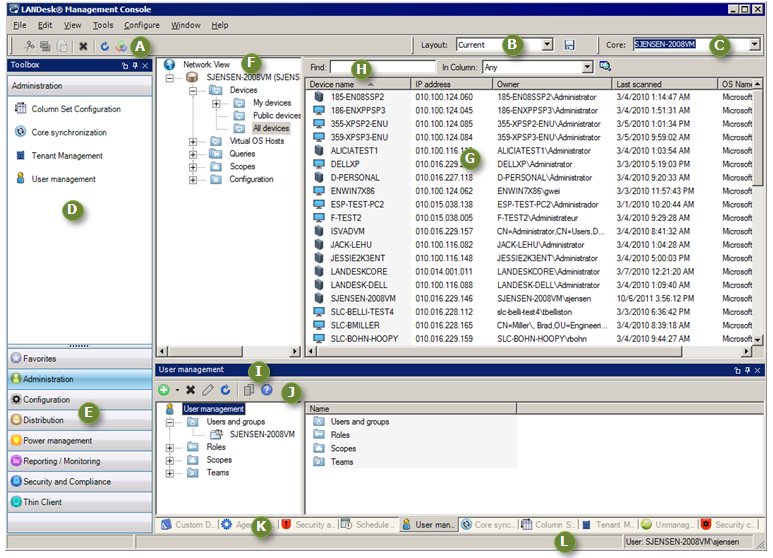 The help topics in this section describe how to navigate and use the console to view and organize devices; and how to access the various management tools. You can have multiple core servers and databases to accommodate your specific network management needs. For information on installing a Ivanti® Endpoint Manager powered by Landesk core server and console, additional consoles, web console, and managing multiple core servers and databases, refer to the documentation hosted on the Ivanti User Community.